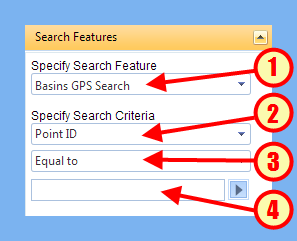 The search features panel allows users to search for various features on the map based on any attributes of that feature. Note that this panel may not be visible if it has been disabled by administrators or if no searches have been created for the current map. 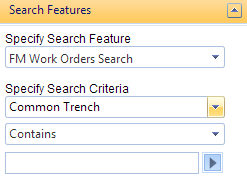 The search feature dropdown shows all of the available layers to search. These are typically (but not always) named after the layer they represent. To search a different layer, select the appropriate item from the dropdown. 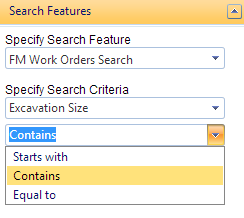 The properties dropdown shows all searchable properties for the selected search feature/layer. 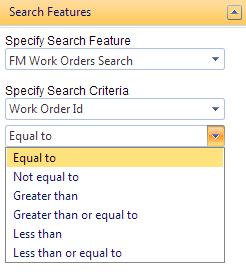 Depending on the property searched, the equality conditions and the user input fields can change. 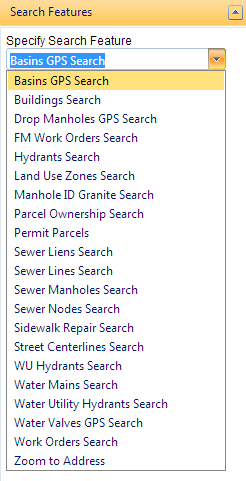 To search a different property, select the appropriate item from the dropdown. Depending on the display type specified for a given property, the equality condition will change. For example, the equality condition for numeric data will be different than the equality condition for string data. In some cases (dropdowns) there will be no equality condition dropdown at all since the equality condition is inferred (=). 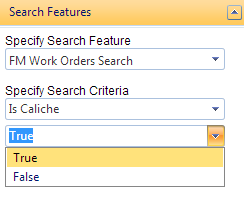 Depending on the display type specified for a given property, the user input for searching will vary. 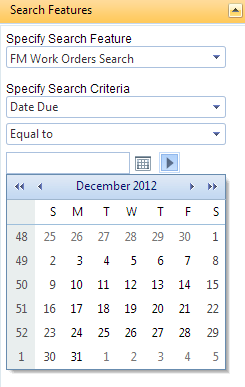 For example, the input for a date/time property will show a date/time calendar control for selecting the date. Once you click on the blue search arrow or select a value from a dropdown, the search results will be shown in the Feature Details panel.